※This exhibition is now concluded. Thank you to all the many people who stopped by. From November 27 to December 10, Kaikai Kiki Gallery is pleased to present “Memories of Resonating Clays”, a solo exhibition of works by Japanese ceramicist Yuji Ueda. Born in centuries-old pottery epicenter Shigaraki to a long line of tea farmers, Ueda’s upbringing was steeped in Japanese tradition. His acquaintance with ceramics began early on; as a child, the remains of old kilns served as his playgrounds, and at home, ceramics were part-and-parcel of the family tea business. 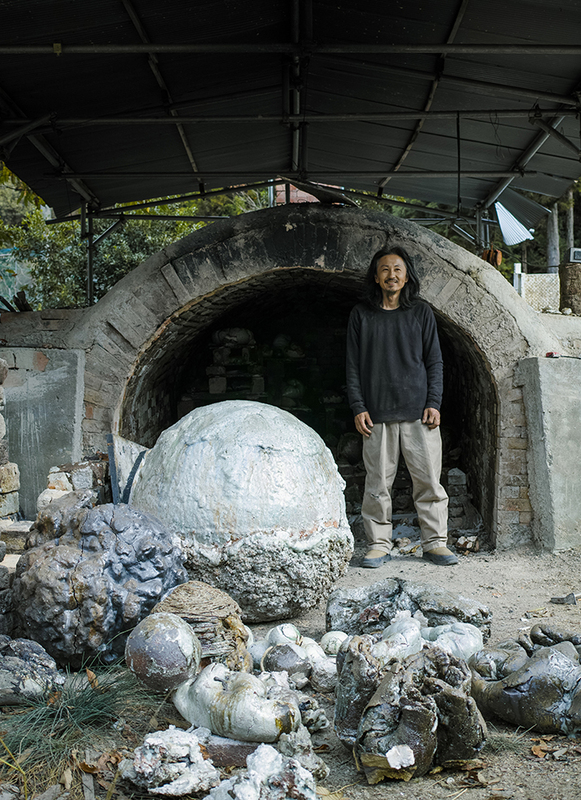 After studying under acclaimed ceramicist Yasuhisa Kohyama in 2002 and gaining his first taste of life as a ceramic artist, he began experimenting with glaze, eventually building his own anagama kiln. Since then, Ueda has developed a distinctive aesthetic that incorporates fissures and unorthodox shapes, and has built up a repertoire ranging from paperweight-sized ornaments to massive, 2-meter tall giants. The wide range of his practice has allowed him to exhibit his pieces not just at small shops and sundries throughout Japan, but also at contemporary galleries and art fairs across New York, Los Angeles and Hong Kong. “Memories of Resonating Clays” presents Ueda’s latest body of work, encompassing over a hundred ceramics from his workshop in Shigaraki. We invite you to experience the essence and striking physical presence of Yuji Ueda’s ceramics through his first solo exhibition at Kaikai Kiki Gallery. When I was small, I would often go play at the remains of old kilns. There, I would find broken pieces of pots and burnt fragments of kiln walls as I dug into the soil with my hands. This would make me ponder over the fact that, even though it was now just a small dirt hill, there were once things that could only be made at this very place. Near my kiln, there is a wide variety of natural clays. I collect them as I go for walks and use them for my works. I carefully check each handful of clay, stacking them one at a time until I’ve created many-layered clumps of earth; and when I fire these clumps with the pressures of air and gas, they deform and sometimes explode. I think there is something to be found in those marks left by such a firing. As my works become greater in size, so does the physical sensation of creating them, and as my body began to grasp the movements of an increasingly dynamic creation process, the ideas for these works came to me naturally. Ten years since his debut, Yuji Ueda has now created his most abstract works as well as his largest work to date for his long-awaited exhibition. The works he produced for this show are, in my subjective opinion, truly remarkable, bursting with his human soul. When I think about the distance he had to cover to get to this point, I am doubly impressed by how he managed to zero in on these works. His was a solitary journey into the world no one had traversed before him. Every detail of his heart’s undulation, from loneliness and unease to contrasting conviction and confidence, shows in these works. I am absolutely blown away by this tremendous body of work. The crucial thing for an artist is not whether you can adequately explain your concept but whether you are able to bring out any and all answers in your work. Of course an artist may be in a certain mood or have a specific theme at any given time, but all the theories in your head mean nothing if you can’t reflect them in your work. In case of a ceramicist, everything from the selection of clays, to temperature, glaze, and how they interact with the natural environment, is the accumulation of information and the artist’s wisdom; only when all these elements successfully coalesce will the resulting work truly become an artwork. His words may seem inadequate for someone over forty, but the body of works he produced for the show overcomes his linguistic childishness, harboring something like a divine artistic glow. This is a body of work that would retain its current freshness when seen in the distant future, whether ten or fifty years from now; because the artist’s life, ambition, sorrow, and hardship are all lumped up and evident in these works. I am in the gallery business precisely in the hope of encountering such artworks and in order to create a space to make such encounters possible. This show makes me feel my efforts have paid off. You might notice my Academy-Award-worthy list of thanks, but such is the magnitude of this project’s success, as well as its difficult, lengthy undertaking. Whether the artist will continue such a tricky form of production would depend on many interlacing factors such as the artist’s motivation, our sustained interest, and business decisions, among others. But even if these works don’t sell, I believe it would be meaningful for him to continue producing such works for at least the next few years. Here, I should probably explain how this exhibition is quite different, in nature and in terms of how it came about, from how things are currently done in the ceramics industry in Japan. Normally, a ceramicist in Japan holds anywhere from two to twenty exhibitions a year with galleries throughout the country, repeating the show in different regions and thereby increasing sales efficiency and generating profit. The works are sold on consignment, with the gallery taking 40% of the profit while paying the artist his 60% only after the works sell. Some galleries may issue promissory notes, further delaying the actual payment and putting the stress on the ceramicists. Although Ueda hasn’t done many exhibitions and has apparently never experienced such a stressful situation as described above, he nevertheless entirely halted the lifestyle of making a living by doing a few shows every year to instead completely focus on this show for the past year and a half. In other words, in order to make this exhibition happen, Kaikai Kiki Gallery has been financially supporting the production of the show. Ueda would let us know his plans for his new work and propose how much he would require. We would ask questions if we have concerns, have the numbers adjusted, and send him the minimum funds necessary for the production. Once the work is completed, he would suggest a price for the piece, and we would pay his share of the profit minus what we had paid for the production. In other words, we have been paying for his works in advance. When we started this project, Ueda and his wife Yui’s sense of balance between production and living, as well as their mental balance, were far from ideal; it was astonishing how little they thought things through, and especially when it came to financial matter, they absolutely had no real sense of it. We held countless phone conferences, had Otani Workshop, who had introduced Ueda to me, join some of those conferences, and I lectured him quite a bit. His work has now drastically changed stylistically as well. Before starting the production for this exhibition, Ueda mainly made his quintessential, fragile works in which the flaky surface layers were in a constant state of peeling off. In the Japanese custom of ceramics appreciation, there is a technique of kintsugi, where a broken pottery is repaired using lacquer mixed with powdered gold; there is an aesthetic of admiring imperfections. That is, in Japan breakable connotes transience and empathy with the ephemeral; there is a tendency to favorably accept it as such. This resonated with the nature of Ueda’s works, making them very popular domestically. However, outside of Japan, there are different ways people appreciate or admire objects, and when something breaks, people sometimes dispose of it or want it exchanged. Many of our overseas clients who purchased Ueda’s works subsequently requested to return them once they broke. I discussed this matter with the artist; would he continue creating works with the fragility at the core of his artistic expression, or would he explore and find a new mode of expression that would enable him to achieve the same creative ideas while shifting the style to something more durable? Ueda chose the latter, and has arrived at his answers now after three long years of exploration. This was a tremendous decision on his part, akin to a religious leader switching denominations. Yet he did it, and successfully at that. The theme of Ueda’s new works is “mono-no aware,” the empathy with the ephemeral, in one’s life. I sincerely hope that ceramic artists and fans of pottery who have been following the ceramic works of recent years and are hoping to understand their essence will come see this show. And for those visitors from overseas, I encourage you to hold in your hands these works that could become the new classics in Japan. It is with great conviction that Kaikai Kiki Gallery presents this exhibition.